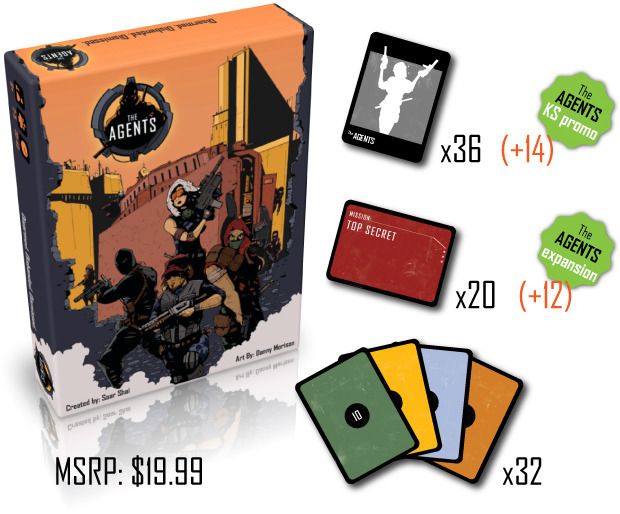 One of the hottest projects on Kickstarter right now is The Agents, and card game for 2-5 players. One of the creators reached out to me a day or so before the project launched, and in my response I said that it was one of the best project page previews I’ve ever seen. The art and design looked great, the reward levels were clearly written and priced fairly, and they had already arranged for a number of third-party reviews. Also, the game looked awesome. I knew right away that I wanted to interview Saar, as I could tell that other project creators would benefit from his wisdom. However, no project is perfect, and so I gave Saar the opportunity to address some of those perceived “weak spots” in the interview below. I think you’ll find what he has to say to be quite insightful. 1. Can you describe your Kickstarter project and why you’re passionate about it? My Kickstarter project is for my new card game The Agents. It’s a total passion project and after years of playing games and coming up with various ideas, it’s the first time that I’ve take a game idea all the way. 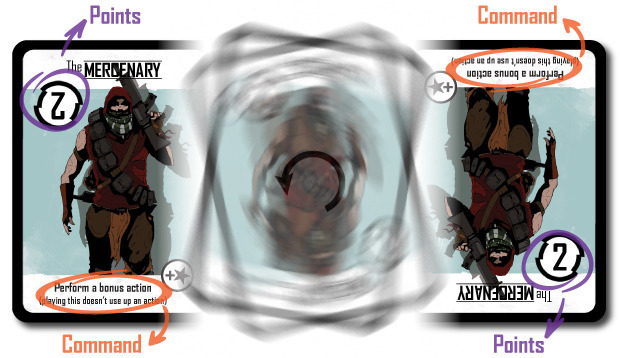 What I love most about the game is its seeming simplicity – it is just a deck of cards – behind which sits a really interesting, new mechanic for which I coined the term ‘Double-edged cards’. I had this idea of creating cards which could be interpreted in different way, depending on how they are oriented, and would benefit two opponents, making for really interesting decision-making moments in the gameplay. So, I’m totally passionate about this new mechanic and love the way it plays out with the ‘spy’ theme. And on top of that, I’m just obsessed with the artwork that my collaborator Danny Morison created for the game. 2. 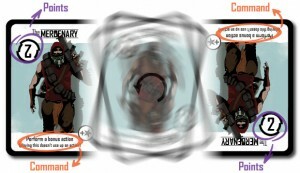 One of the unique aspects about your game is the double-edged card mechanic. Curious readers can go to your project page to learn how that works, but for this interview, could you name three other games that, if people like those games, they’ll also enjoy The Agents. That’s a tough one since it really is a pretty unique mechanic which leads to new interactions between players. I’ll tell you three games that I love and that have inspired me, how’s that? I think I’d have to start with Magic. Really the go-to card game, still to this day. It’s another game that is ‘just cards’ but is a whole world in itself. I love the endless types of cards that you can fall in love with and the player interactions in the game. It’s endlessly expandable, which is what I tried to do for The Agents. Another game I love is 7 Wonders, and it shares the mechanic of direct interaction with your neighboring players with The Agents. There’s also the decision-making factor of what you don’t take for yourself goes to another player. However, they are quite different games and I’m not sure I’d immediately recommend it to someone who likes The Agents, and vice versa (though I would recommend The Agents to EVERYONE). Lastly I’d choose Ticket To Ride. I enjoy the secrecy of planning a route such that other players don’t pick up on where you’re going and get in your way. This is something I’ve tried to incorporate in The Agents for the missions element, and I think it’ll be much more prominent in future mission expansions. It fits perfectly with the theme of espionage and sabotage. 3. Sometimes there is a disconnect between the art for a game and the game itself. That isn’t the case at all for The Agents—you could not have picked a better artist for your game. What was your process for finding the perfect artist for The Agents, just so other game designers can employ a similar process? From very early on in building the concept of the game, I knew that I wanted to try to really capture the intrigue and mystery of the theme of ‘espionage, covert operations and deception’. I had a very cinematic approach to creating the world of The Agents – the back story, the character development in conjunction with their special abilities and so on. But I also didn’t want the artwork to be too cliche, hammy and obvious nor did I want it to be too dark or creepy! I wanted something accessible but complex and that’s what Danny managed to create. When looking for an illustrator my first port of call was DeviantArt and I spent a lot of time browsing around, looking at different styles and the kind of projects people had worked on previously. I spoke with quite a few artists and for me Danny just stood out as a clear winner. His art style, his imagination, the scope of his work and then after chatting, his own personal spark and energy made him the only choice as my collaborator. I’ll also mention the partnership that we built as it might be helpful for people to know about. We agreed that I would pay Danny for a chunk of the work (a fraction of what he would normally charge), and that he would also get a %age of any profits made by the campaign. So he really came in as a partner in the truest sense, taking a much smaller payment upfront and taking a risk on getting paid the rest! 4. The Agents has a beautiful project page. Do you have a background in graphic design or copywriting? Thanks! I have a background in advertising, and that’s where I got a great introduction to both the copywriting and design side of things. I would definitely count myself as a graphic design enthusiast but that’s probably where it ends! In addition, my multi-talented girlfriend who is an amazing writer helped me to design the project page, the campaign, the language and so on. 5. You used a number of early-bird reward levels to encourage people to back your game the first time they visited the project page, and the results were that you doubled your funding goal on Day One. We chatted a few days before you launched, and I agreed that it was a good idea for your first game project, especially since the corresponding levels weren’t more than a few dollars over their early-bird counterparts. However, I wasn’t as enthusiastic about the Collaborator level. At that level, for $60 a backer gets a full digital PnP as soon as the project ends and the ability to offer feedback to you about the game. All other backers get a more limited PnP (I think that it’s black and white and doesn’t include all the cards). What has been the response to asking backers to pay a premium to test out the game? How have backers responded to the limited PnP? Ah. Well, I think I may have spotted the problem. We’re actually sending backers at the Collaborator level a physical digital print of the game, not just a PnP. All Collaborators will be sent a proper copy of the game within a couple of weeks of the campaign ending. Collaborators will have a window to play the game and come back to me with any thoughts or suggestions before I go to print with the final game. And of course they’ll be the first to get hold of the actual game. The response to the release of the PnP has been staggering – completely unexpected. By the way, since you sent me the questions, I’ve released the full game as a B+W PnP. Backers absolutely seem to love the chance to get to grips with the mechanics, learn the rules and play the game. Some of our backers have played the game 10s of times, taught friends and gaming groups and sent me excited messages with ideas for Agents, Missions, new mechanics, ideas for expansions and so on. I think people loved getting a chance to ‘see before they buy’. This has been one of the best bits of the campaign. 6. What are a few key elements and principles you incorporated into your project that you think future Kickstarter creators could benefit from knowing? You’ll be about 10 days into the project when this interview goes live—what have you learned during that time about running a Kickstarter? 1. The most important this is to love your product and love your project. If you aren’t totally in love with your idea then don’t bother. The KS community are a smart, experienced bunch. They know if someone believes in their product or not. And if you do, believe me, they will too. 2. Be in a state of preparedness before you launch. I.e play-test the game to death, revise the rules endlessly, reach out to bloggers really early, draft your campaign text/tiers etc in advance. Just start doing bits and pieces a few months in advance and ramp up in the weeks before launch. It makes the world of difference. 3. Have great, almost complete artwork. Nothing makes the game more professional looking than having colorful, well designed artwork with physical prototypes to show for it. 4. Be present. Clear the decks. I’ve done nothing else in the past week but chat to backers, prepare updates, answer questions, listen to suggestions and requests and then of course, continue getting the game ready for production. I’ve sent a personal email of thanks to each and every backer whether they pledged $1 or $300. Everyone has been so appreciative of that and it’s encouraged a lot of interesting discussion and the exchange of ideas. 7. You co-created one other Kickstarter project, Ringbow, which had a slated delivery date of November 2012. What is the status of that project? I’ve seen comments in a few places that indicate that people are worried that The Agents won’t deliver on its promises based on what happened with Ringbow. Can you address those concerns here? As far as I understand it, the CEO of Ringbow is still hard at work to complete production. Ringbow is a completely different animal. A piece of computer hardware, with multiple complex electronic components being manufactured across a couple of different countries with a range of experts each working on their component. Bringing everything together seamlessly to make a working electronic product is mind-bogglingly complicated. Ringbow seems to have suffered from unreliable production partners and unforseen complications. Very sadly, that happens more often than not. I hope more than anyone in the world that my invention comes to fruition and sees the light of day. With The Agents I went completely the other way! I came up with an idea for a totally simple game that takes the form of a deck of cards. Cards are straightforward, easy and cheap to produce. And the production isn’t dependent on one specialist manufacturer. I have back-up plans for my back-up plans if something should go awry with production! I spent months designing and play-testing the game and brought it to an almost finished state before launching on KS. Titans of the industry have physically received, played and previewed an almost finished game and their support and praise goes a long way to reassure backers that this game IS going to happen. I think from one glance at this campaign, people can tell how committed I am to making The Agents work and can see the effort that I’m putting into doing everything right. After all – this is just me, designing a game, chatting to fellow gamers, trying to make something wonderful. I think people can see that. 8. You chose a Kickstarter campaign length of 48 days. If you had known pre-launch that you would fund (and overfund) the project so quickly, would you have chosen a shorter campaign length? What advice can you offer to other creators about campaign length now that you’ve had this experience? I probably would have kept it a little shorter, but probably not by much. We’re now about 35 days to go and I still have a lot to get done before we go to final print. I also have a bunch of fun contests, missions and news to roll out. I wanted to give myself breathing space in the campaign to come up with cool ideas and make them happen, or be reactive to backer suggestions and see if I can make them work. I think the only thing that I’d really have done differently if I’d known the campaign would blow up the way it has, is space out my stretch goals better. I had about 4 stretch goals announced and ready to go at launch, and we smashed right through them in a day. That put a lot of pressure on me to gather my thoughts and plan out the next batch which I’d been hoping to have at least a few days to do! I think maybe the trick to this (which I think you mentioned in your posts?) is to maybe announce the SGs but not necessarily the targets, letting you spend the first day or two watching the campaign progress and figuring it all out. 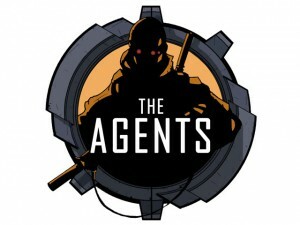 Click here if you’d like to join me in backing The Agents. Great interview. 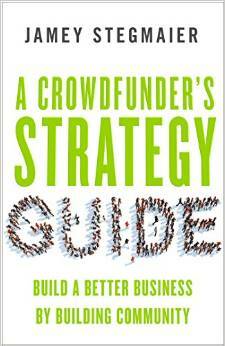 I’d agree 100% with is #2 point about reaching out to bloggers and reviewers early. I don’t know how many times I’ve been contacted to review/preview a kickstarter game during their campaign. People don’t understand that you need time to do that properly. Saar reached out to us to review/preview his game about 3-4 months ago. That’s the right way to do it. Plenty of time for us to thoroughly run through the game and also provide him with feedback. They are giving a colour PnP at the end of the project, but I am waiting to hear how international backers can get a colour PnP expansion stretch-goal set without backing at the level where you also have to pay for the physical copy. Tucker, you receive the full PnP at a $1 pledge, and the expansion PnP’s are released for pledges that are $15+ (which means, you’d be ordering a physical copy of the game, and paying shipping/customs). It’s in the comments of the most recent update. Saar is releasing the expansion PnP’s for full color as stretch goals. Once unlocked any backer getting a PnP copy…Every Backer, will be getting the expansion PnP’s as well. Again he seems to have forgotten to space things out and make us work for it as the goals set for this are well within reach and one of which has already unlocked. @Ambie, Saar has just opened a $5 pledge level for that. In the last update, he has mentioned that he’s still working on shipping international games from outside the US and that he expects to have some news on that front shortly – here’s hoping! I am concerned about the mud slinging surrounding the Ringbow project, among other things. He states that he is based in New York, which is untrue. Apparently he is in Israel. I also believe that one way or another, you should not start a second KS project when you still have an unfinished one. What is stopping him from using funds from this to bring about Ringbow? After the failed Cthulhu/Monopoly game, which I haven’t backed, I am becoming a lot more cautious. @jamey, i am curious what your impression of Saar was? I’m an early bird of the agents and all signs seem to point that his board game project is very legit, and his previous invention has run into some snags, and due to legal reasons not all information can be shared. Hobbes–Well, the only interaction I had with Saar was the text you see above. My other correspondence went through someone who has been helping him from behind the scenes. That person seemed very nice. gotcha, was curious, when someone’s past comes up as it is in this project, it seems to be wise to partner with a known entity, such as Game Salute to get that project more validity. I saw Upon a Fable get helped out by that with Kicking it Games, and it seems to be a good way to get backers to be happy with things. Curious if you maybe able to do an interview with Upon a fable’s creators and what your thoughts would be if they’ve had failures in their past, how to correct the ship, so to speak. The BGG and KS can get out the pitchforks rather quick. So like a hindsight interview about the two Upon a Fable Kickstarter projects? That could be interesting. Yah, I personally thought Upon the Fable was ran really well, but the need for a known publisher helped a new game company. Seems like people get out the pitchforks rather quickly these days. I guess I think it maybe a good topic, have a failed project/ past failures, how to move forward, and gain trust again. It seems like dyskami publishing has went through that, maybe a good topic to cover, but one that may need to be shelved until their game is delivered.